All the National Committees/ Committee are requested to send their nominations by inviting contributions on outstanding achievements from all those professionals/ farmers who are engaged in water saving/ conservation activities. The deadline for receipt of the entries from the National Committees along with a completed Nomination Form (Annex 1) to the Central Office ICID, New Delhi is 31 May 2013. The ‘Conditions and Criteria’ set for the awards are given in Annex 2. Annex 3 shows the checklist of enclosures to be forwarded by the National Committee while submitting the nomination(s). The national committees/ committee are requested to carry out primary evaluation of the nomination(s) in light of the questions posed in the evaluation process, and submit only one of them in any particular category (if there were more responses) to the Central Office, New Delhi. Nominations not complying with the above requirements or more than one nomination from the same National Committee in a particular category are liable to be rejected. Full details of the awards and excerpts of the past award winning contributions are available on ICID website www.icid.org/awards.html. Triennially, N.D. Gulhati Memorial International Lecture is delivered by an eminent professional at the time of Congresses. The Irrigation Sector Shift from Construction to Modernization: What is Required for Success? The 7th N.D. Gulhati Memorial Lecture for International Cooperation in Irrigation and drainage was delivered by VPH Chandra Madramootoo at Lahore Congress. The lecture provided an overview of the challenges facing irrigation and drainage community, and the need to better manage our irrigation and drainage systems to reduce poverty and hunger. The following is a summary of some key aspects of his presentation. Of the 1500 million ha of global crop land about 277 million ha (18%) are irrigated. The largest share of the irrigated area is in Asian region (70%), followed by North and Central America (11%), Europe (9%), Africa (5%), South America (4%), and Oceania (1%). During the last four decades the crop land has increased marginally, while population has more than doubled leading to a reduction in the area of land needed to produce food for a person. 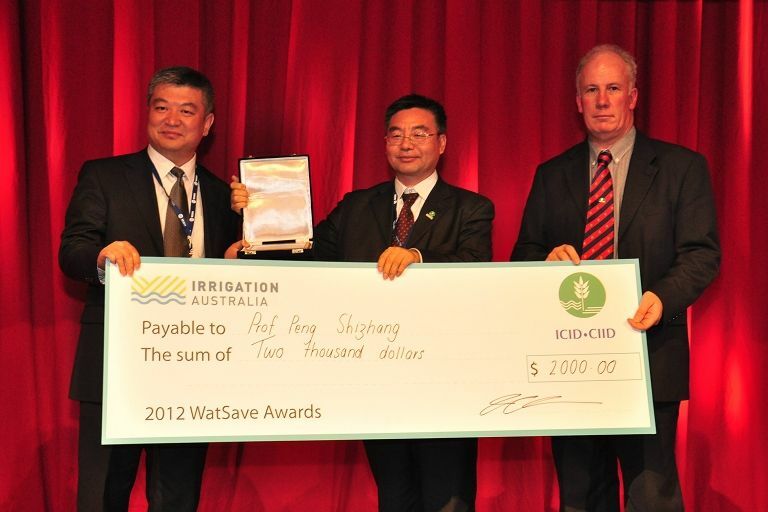 Irrigation has played an important role in increasing crop productivity. However, the rate of irrigation expansion has declined from 2.3% in 1970-80 to 0.6% in 2000-05 (see figure). Some countries will increasingly face water scarcity. Future needs of water for food are huge and improved water management systems will be required to cope with the demand. During the last four decades the crop area harvested has hardly increased, while the world cereal production has increased by about two and half fold. In general, the overall food prices (in USD) are up by 75% since 2000. Cereals, in particular rice and wheat dominate food supply and provide the largest share of energy to the world's population. However, globally, close to one billion people still remain malnourished, of which some 800 million live in least developed countries (LDCs). The Millennium Development Goals (MDGs) has targeted to reduce this number by half by 2015. In fact the preliminary goal of MDG attempts to highlight this given its importance. This translates into a need of reducing 22 million per year, while current rate is only 6 million per year - posing a big challenge to bridge the gap between the target and achievement. There are contradictory views as regards the impact of increasing bio-fuel crop production on food availability. Some view that this might cause food shortage and consequent hike in the food prices; while a few others opine that bio-fuels provide LDCs and poor farmers new opportunities for employment to improve their economy and livelihoods. There has been growing concerns over declining irrigation system performance and investment benefits, especially in the large-scale public irrigation schemes. Improvement in both viz., conveyance efficiency and on- farm water management is a key for increasing the overall irrigation efficiency. Efficiency gains of 14% in gross withdrawal can also be achieved through reuse of return flows. Improved surface irrigation methods like level furrows, sprinkler and micro irrigation methods and use of advanced techniques of irrigation scheduling can help improve on-farm water management. Modernization of irrigation and drainage systems in a broad sense (technical, management, financial, environmental) will be required at a large-scale, especially in emerging countries to achieve the required increase in food production, and also, in some cases, to save water for other uses. It is seen that the public spending on agriculture is the lowest in the agriculture based countries, while the share of agriculture in GDP is the highest. National and international investments in agriculture, official development assistance (ODA), and the World Bank's lending in irrigation have been declining steadily and a complacency set in that is a major cause of the recent global food shortage. In most developing countries, the agricultural sector is considered as an engine of growth and national governments therefore should reinvest in agriculture and associated infrastructure. In order to reduce water withdrawals for irrigation, upgrading of irrigation infrastructure through rehabilitation and modernization should be given priority. Other aspects like timely maintenance of irrigation and drainage infrastructure, investment in water storage and water saving technologies, combating the twin menace of waterlogging and salinity through drainage are required. Public-private investment in infrastructure is to be encouraged. One size does not fit all, and solutions have to be case specific. Maximizing basin water productivity through multi-objective decision making process, developing a rapid innovative research agenda, capacity building at all levels and building of institutional support for local, regional and international markets will go a long way in achieving food security. External factors, like impacts of bio-fuel production, climate change, virtual water trade, changes in agriculture markets and the prices of commodities will influence agriculture growth and allied activities. Such changes will require additional adaptations in the development of water management measures to sustain global food production to desired levels and avoid the probability of a severe crisis in the coming years. ICID in 2003 instituted the Best Performing Workbody Award (BPWA) to be presented triennially at the time of ICID Congress, based on the various facets demonstrated by the workbodies in between two Congresses. 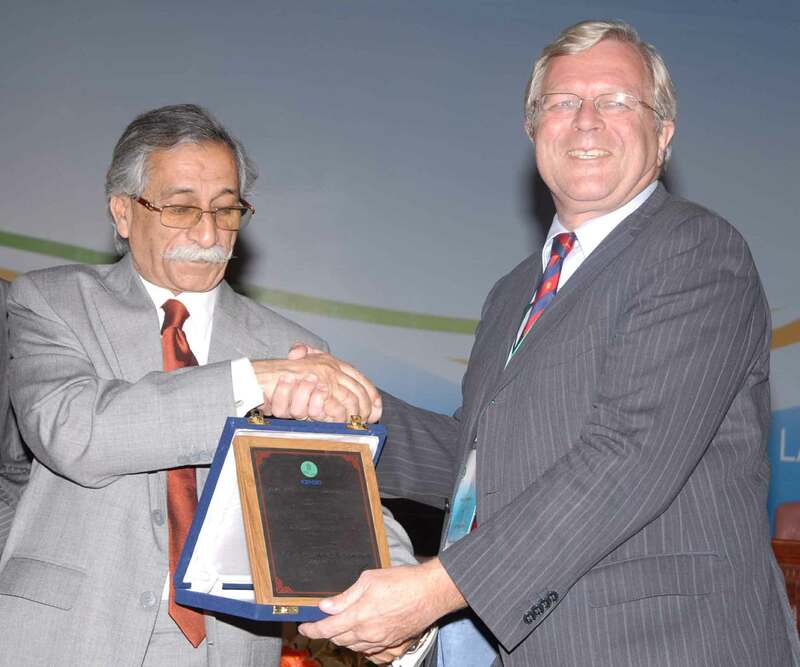 The first Award was presented at the 19th ICID Congress held in Beijing in September 2005 to Working Group on History of Irrigation, Drainage and Flood Control (WG-HIST), second Award was presented to ICID Journal Editorial Board (EB-JOUR) at the 20th ICID Congress held in Lahore in 2008, and third Award was presented to Working Group on Sustainable Development of Tidal Areas (WG-SDTA) at the 21st ICID Congress held in Tehran in 2011, for their excellent performance, impressive achievements and outstanding contribution. Citation / Certificate / Plaque to each member of the Workbody (as per the latest membership composition) and publicizing the Award winning WG through a webpage on the ICID website giving achievements of the Workbody and personal profile of each member. Free publications of decided value to each member of the WG. The formal proposals should be sent for consideration with all requisite information and supported by relevant documents, for evaluation by the Panel of Judges. The last date of receipt of nominations from ICID Working Groups / Committees is 2014. The 3rd Best Performing Workbody Award (BPWA) was presented to the ICID Working Group on Sustainable Development of Tidal Areas (WG-SDTA). The performance of a workbody is adjudged based upon a set of criteria and its contribution towards the mandate and mission of ICID. 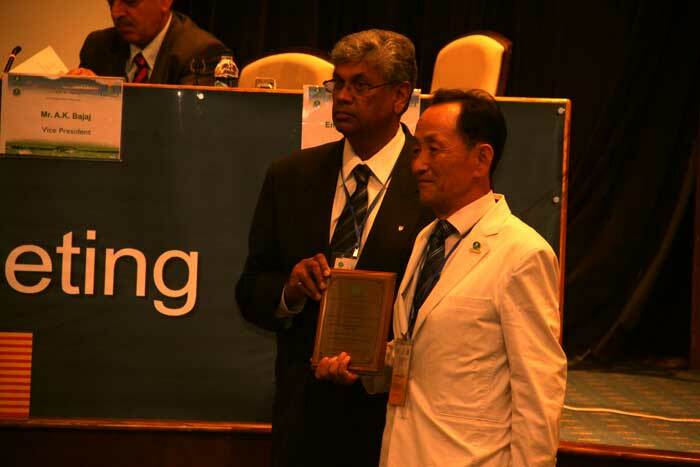 The Award was presented to Dr. Park Sang Hyun (Korea), Chairman, WG-SDTA by the President Chandra Madramootoo on the occasion of the 62nd IEC and 21st ICID Congress held at Tehran, Iran, October 2011. The Best Performing Workbody Award (BPWA) was instituted by ICID in 2002. The performance of a workbody is adjudged based upon a set of criteria and its contribution towards the mandate and mission of ICID. The BPWA 2008 was presented to the ICID Journal Editorial Board (EB-JOUR) by the Governor of Punjab on 17 October 2008 on the occasion of the 59th IEC and 20th ICID Congress held at Lahore, Pakistan. ICID Journal acts as a mouthpiece to communicate to the international water community ICID's sixty years of experience in the promotion and transfer of water and land management technology and related issues. ICID Journal was granted Science Citation Index Expanded (SCIE) starting with Vol.49, Issue No.1 of 2000 which was the first issue of the quarterly Journal printed and distributed under ISSN 0971-7412. ICID Journal was also selected for coverage in Current Contents/Agriculture, Biology and Environmental Sciences (CC/AB&ES). The Best Performing Workbody Award (BPWA) was instituted in 2003 to recognize the performance of workbodies between the two Congresses. 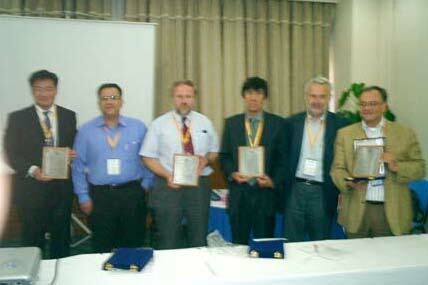 The first such award has been given to Working Group on History of Irrigation, Drainage and Flood Control (WG-HIST). The WG-HIST was established in 1980. The Group has published more than 30 volumes of Water History related documents and books, including Historical Dams (ICID 2001), The Danube Valley (ICID 2004), The Indus Basin (ICID 2004), "A History of Water Issues" (UNU 2005), and History of Irrigation and Drainage of various member countries. 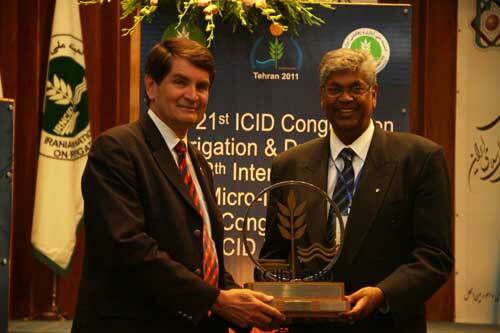 ICID has instituted the 'Best Paper Award' in 2006 in recognition of the outstanding paper contributed to Irrigation and Drainage, the Journal of ICID. Annually, starting on the occasion of the 57th IEC meeting (2006) in Kuala Lumpur, an award will be given to the best paper published in the issues of the Journal in the preceding year (January-December). Decision on the best paper will be made by the Editor in consultation with the Associate Editors. The award will be a citation plaque and Gift Books from M/s. John Wiley & Sons Ltd. (UK). Zahra Paydar, Freeman Cook, Emmanuel Xevi, and Keith Bristow (Australia) received 'Best Paper Award 2012' for their outstanding paper titled "An Overview of Irrigation Mosaics" published in Volume 60, No.4. 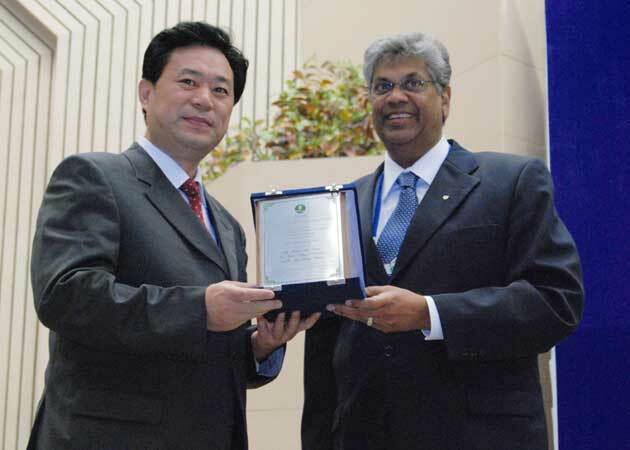 VPH Stephens receiving Best Paper Award 2011 from President Chandra Madramootoo in recognition of the outstanding paper titled "Airborne Remote Sensing for Detection of Irrigation Canal Leakage" by Yanbo Huang, Guy Fipps, Stephan J. Maas, and Reginald S. Fletcher (USA) published in Volume 59, No. 5. Mrs. Jianxin Mu, Mr. Shahbaz Khan and Dr. Zhanyi Gao receiving Best Paper Award 2009 from President Chandra Madramootoo in recognition of their outstanding paper titled Integrated Water Assessment Model for Water Budgeting Under Future Development Scenarios in Qiantang River Basin of China published in Volume 57, No.4. Dr. L.K. Smedema (The Netherlands) received 'Best Paper Award 2008' for his outstanding paper titled "Revisiting currently applied pipe drain depths for waterlogging and salinity control of irrigated land in the (semi) arid zone" published in Volume 56, No. 4. Drs. S. Khan, S. Mushtaq, Y. Luo, D. Dawe, M. Hafeez, and T. Rana received 'Best Paper Award 2008' for their outstanding paper titled "Conjunctive Water Management Options: Examples from Economic Assessment of System-level Water Saving through Liuyuankou Irrigation System, China" published in Volume 56, No. 5. 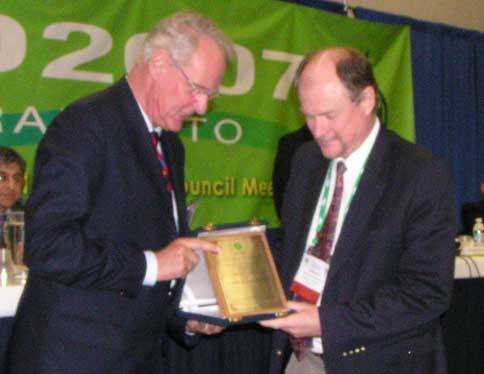 Dr. G R Backeberg (South Africa) receiving Best Paper Award 2007 from President Lee in recognition of his outstanding paper titled Reform of User Charges, Market Pricing and Management of Water: Problem or Opportunity for Irrigated Agriculture published in Volume 55, No.1. Dr. T.B.S. 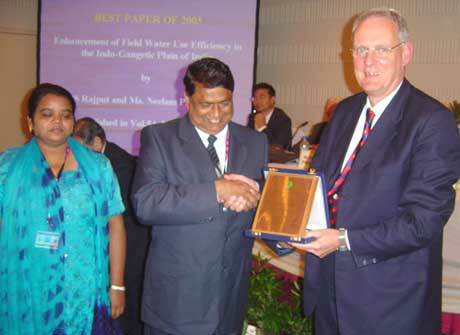 Rajput and Dr. Neelam Patel (India) receiving 'Best Paper Award 2006' from President Lee in recognition of their outstanding paper titled "Enhancement of Field Water Use Efficiency in the Indo-Gangetic Plain of India" published in Issue 54.2. ICID in 2002 instituted an Award to recognize the Best Performing National Committee (BPNC). The award is presented at every triennial Congress. The performance of a National Committee is judged on the basis of various facets demonstrated by the participating National Committees between two successive ICID Congresses (over a three year period). The award consists of a shield and a citation plaque. 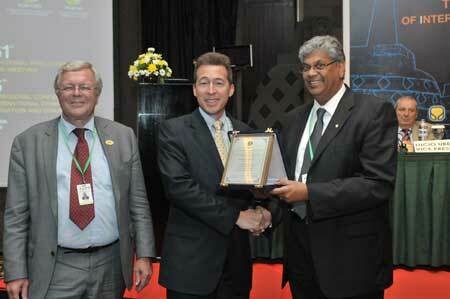 South African National Committee on Irrigation and Drainage (SANCID) has won the 4th BPNC Award. 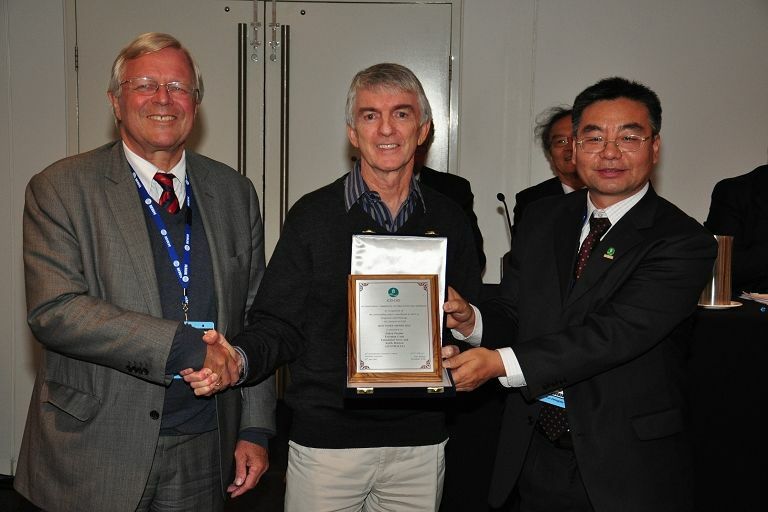 The award was received by VPH Felix Britz Reinders from President Chandra Madramootoo on the occasion of the 62nd IEC and 21st ICID Congress held at Tehran, Iran, October 2011. 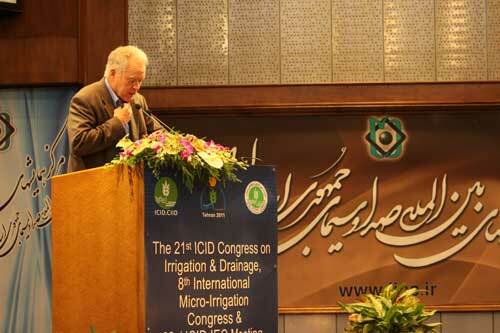 Iranian National Committee on Irrigation and Drainage (IRNCID) has won the 3rd BPNC Award. 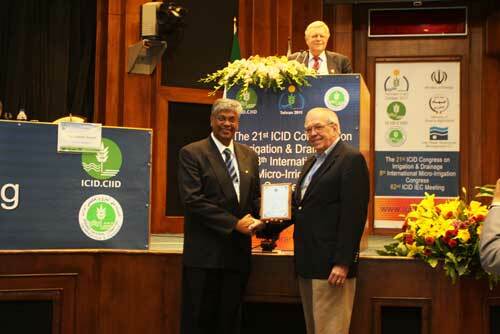 The award was presented to IRNCID by the Governor of Punjab on 17 October 2008 on the occasion of the 59th IEC and 20th ICID Congress held at Lahore, Pakistan. 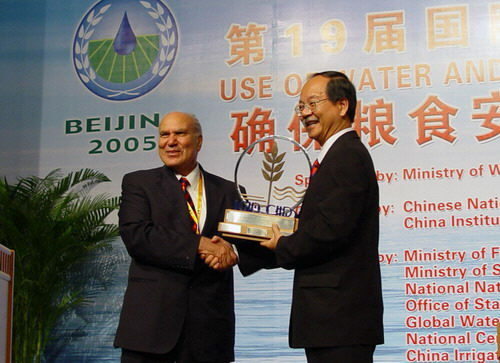 Egyptian National Committee on Irrigation and Drainage (ENCID) won the second Award for Best Performing ICID National Committee at 19th ICID Congress, Beijing, China, September 2005. 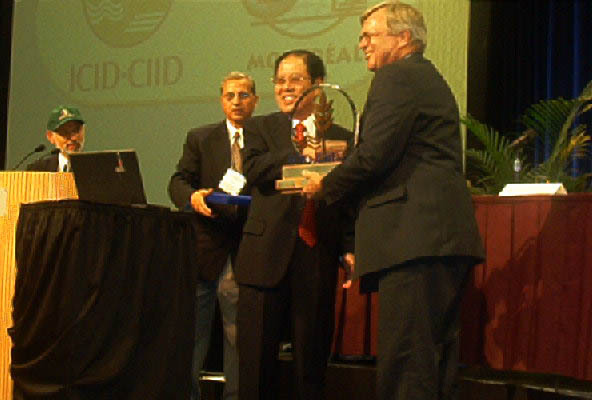 Korean National Committee of ICID (KCID) won the first Award for Best Performing ICID National Committee at 18th ICID Congress, Montreal, Canada, July 2002. The Dr. Hassan M. Ismail Memorial International Award has been established with effect from the 16th ICID Congress at Cairo in 1996 to be awarded to a young professional for the best paper on the development of irrigation, drainage and flood control in Africa, submitted to an ICID congress or ICID's Afro-Asian Regional Conference or an African Conference. The award is made from the proceeds of a fund established by the Egyptian National Committee with donations from the family of Dr. Hassan Ismail and his admirers.